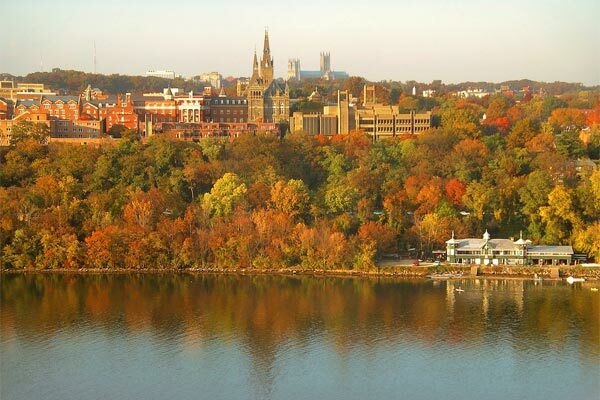 It’s the most wonderful time of year to visit colleges—or is it? Here’s what visiting campus is generally like during winter, spring, summer, and fall. You probably already know that college visits are incredibly helpful when figuring out where to spend the next few years of your life. They give you a chance to see what your life would be like as a student, and there’s really no other way to get a true “gut check” of how a campus makes you feel when you’re there. The question is, which time of the year is best for exploring your potential new college home? There are four seasons to choose from, and they all have some pros and cons. And although I can’t tell you the exact perfect time to go every single college on your list, I do have some guidelines that can help you pick the best time(s) to visit your intended colleges and universities. Summer might be the most hotly (ha!) debated time to visit campuses. Not missing high school and having a campus all to yourself is great, right? Not so fast. Yes, having a campus mostly to yourself means you can take your time and see the grounds without any of the hustle and bustle of a college in action. And, thankfully, many colleges still offer formal tours during the summer (though perhaps with modified “summer hours”). However, you aren’t going to get a truly accurate representation of the college’s daily life during the school year. Also, if you’re on summer break, there’s a good chance the college students are too, and finding one to talk to may be harder than expected. Fortunately, colleges are rarely completely deserted, given summer classes, year-round research, and professors working in their offices. But finding these people might be a struggle. Not to mention summer vacation season means travel costs go up, from the cost of gas to plane tickets to hotel rooms. All this being said, if summer is the only time you can visit a campus, then by all means, go for it! A summer visit is better than no visit at all. If you are in the area (like on a family vacation) and want to check out a campus, a quick peek around is a great idea. You might even run into a summer pre-college program for high school students or an accepted students open house. But you might also want to consider making a return trip when school is in session if you can. Fall is often the nicest time of the year for scenic walks around college campuses. (That’s why there are lots of pictures of students smiling with leaves changing around them on college websites!) The winter doldrums haven’t set in yet, and if you visit early enough, students will still be all bright-eyed and bushy-tailed! Also, lots of colleges offer their “best” open houses in the fall, with extra events, speakers, and opportunities to get to know the school. Finally, there are plenty of students out and about you can talk to, since class will be in session. All of this makes fall one of the best times for you to intensely explore a campus. There are, however, a few drawbacks to visiting in the fall. One is the fact that a new school year will have just started, especially if you go early in the season. This may make campus a bit hectic. In addition, a quarter of the students will be brand-new freshmen who don’t know much more than you (although they may be able to give a good perspective on the application process, since it’s so fresh in their memories). There is also the problem of high school conflicts. The timing for fall high school breaks vary somewhat, so check to see if any colleges you’re interested in have classes going on during your fall break. This is a great way to see the best of a college without missing any of your current classes. Organized visit days in the fall are usually meant for seniors and are placed a month or so before early admission deadlines. These visits are for students who are seriously considering the college, and some even include overnight stays in dorms. Winter is the calm between the storms at most universities. The freshmen have figured things out by this point, and the seniors aren’t stressing too much over graduation yet. Fall finals are over, and a fun winter “inter-term” might even be in session. Winter is a nice time to talk to people (in a cozy college coffee shop, perhaps? ), but often the worst time to venture around any campus in a cold, snowy area. Depending on how far north you go, the extent of your campus visit might be what you see as you sprint from heated building to precious heated building. Winter is still a great time to visit if you want to look at the academic and financial aspects of a college, but an organized winter campus tour might not be the most pleasant—if the college even offers one at all. Springtime is similar to fall, as far as the general vibe and stress level on campus. The biggest difference between the two seasons is often what’s causing that stress: instead of wide-eyed freshmen trying to find their classes, there are wide-eyed seniors trying to figure out what they’re going to do after they graduate. One key difference between fall and spring campus visits is that most of the formal springtime college visit days and open houses are geared towards high school juniors and underclassmen (since high school seniors would have already made their college decisions). These events are meant to be introductions to the colleges and provide general overviews of campus and admission. No matter when you go, the importance of visiting campus for yourself cannot be overstated. While you should think about what visiting might be like during a given time of year, remember that you’re going to have to live through all of these seasons (at least to some degree!). And if you think you can or should visit a school times during multiple seasons, you may be able to do that too—time and money permitting, of course. The time of year of your visit becomes more important if you intend to move far from home. If you’re considering a college in a climate you’re unfamiliar with, I suggest going when you think the weather will be the worst. For example, if you have lived in St. Paul, Minnesota, all your life and you’re thinking of going to school in southern Alabama, visit in the summer. You don’t want your first 110-degree day to be when you have to sprint to the other side of campus. Now, all this being said, if you can’t visit at all, regardless of the season, know that it’s not the end of the world. There are many ways to get a good sense of your colleges before enrolling, from doing extra research to interviewing local students to going on every virtual tour and watching every campus YouTube video you can find. But, if you can visit your campuses, it’s probably in your best interest. And if you can’t afford college visits, try asking the admission office if they can cover your trip—you never know what they might be able to do for you! What time of year are you planning to visit colleges? Or if you’ve already visited some campuses, when did you go? Leave a comment and let us know.